GARMISCH, Germany – There are many wonderful benefits to living and working in a small military community. People greet you as you walk down the street. All the baggers and cashiers know you by name in the Commissary. The post master passes by and yells over his shoulder that you have a package waiting for you at the Post Office. Neighbors are there to help whenever you need something. In short, there is a lot to be thankful for in a small community. 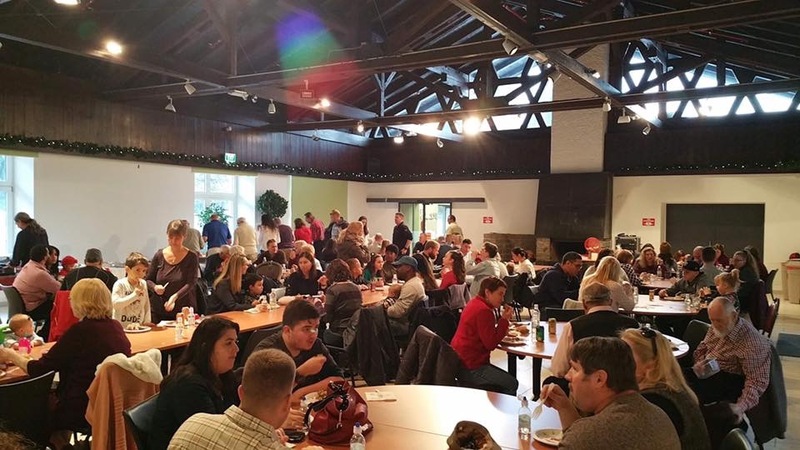 Perhaps that’s what makes Thanksgiving Dinner so special for the families of United States Army Garrison (USAG) Bavaria-Garmisch community. For the past two years, more than 100 people have come together to celebrate Thanksgiving Dinner as one big family at the Pete Burke Community Center in Garmisch. The Garmisch Community Club, in cooperation with the Garmisch Community Chapel organizes the annual event by providing turkey and ham while families bring side dishes to share. After the chaplain gave the blessing, folks filled their plates with all types of food set out along a 30-foot table. From turkey and ham, to cranberry sauce and green bean casserole, mashed potatoes and stuffing, to ice cream and assorted pies, there was plenty to eat! Families sat down with other families, enjoying each other’s company. Christmas music played in the background, and laughter resonated throughout the hall. When everyone had had their fill, most hung around to continue talking with their neighbors. Children played outside on the bouncy house provided by Edelweiss Lodge and Resort while their parents sat down to make Christmas wreaths to hang on their front doors. No one was in a hurry to leave. “There really are no words to describe how special this community is to me,” said Preston Lee, a 91-year old veteran who has lived in Garmisch since the 1960s. “Even though I have lived in Germany for over 50 years, it’s still nice to be able to be a part of this community here on post. Going to chapel every Sunday and coming to celebrate Thanksgiving Dinner with these folks is what reminds me how thankful I am to be an American,” expressed Lee. Giving thanks helps us to recognize, appreciate and be grateful for the many blessings in our lives. In truth, we should do it throughout the year, but it’s nice still nice to have one day set aside dedicated to giving thanks. Living in Garmisch that means coming together as a whole community, sitting down to a meal prepared by one another, and being thankful for food, friends, and family.